This is super cute. I like all the little touches that recall something homemade: the splatters, the doilies, the little spatula, etc. All the clusters look great. I like the way you tucked the recipe under the photo, too. Beautiful work! I love the doily it looks perfect in this, and yummy! I love banana bread. totally hungry now!!! This layout turned out great - love all the little details! 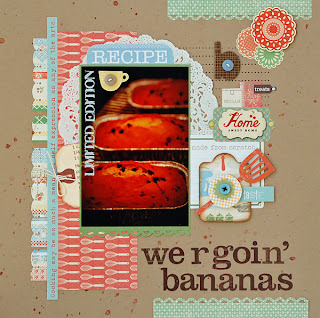 oh yummmm i love banana bread. the page and bread are both yummy! Oooo...you're making me hungry! Love the splatters and big doily! I love those little doily shapes on here. I love all your little touches Lisa! This is great! 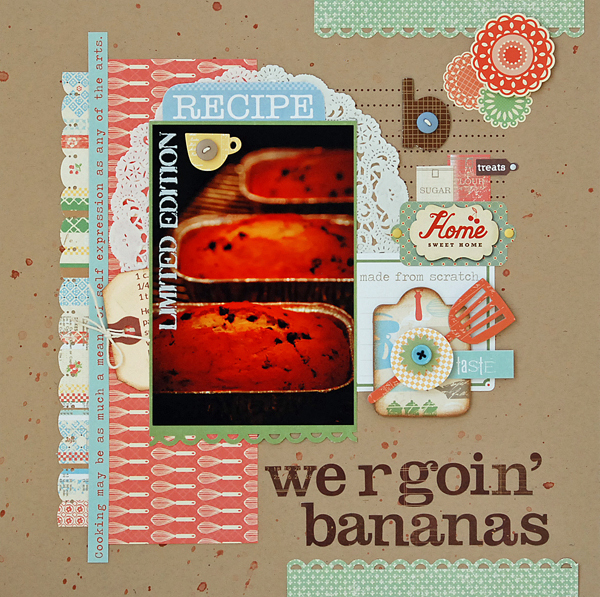 Love all your layers on this page and of course chocolate chip banana bread is the only way to have banana bread! Wonderful page! The pp is perfect for the pic!